Would you believe that this is the face of a dog toy serial killer? 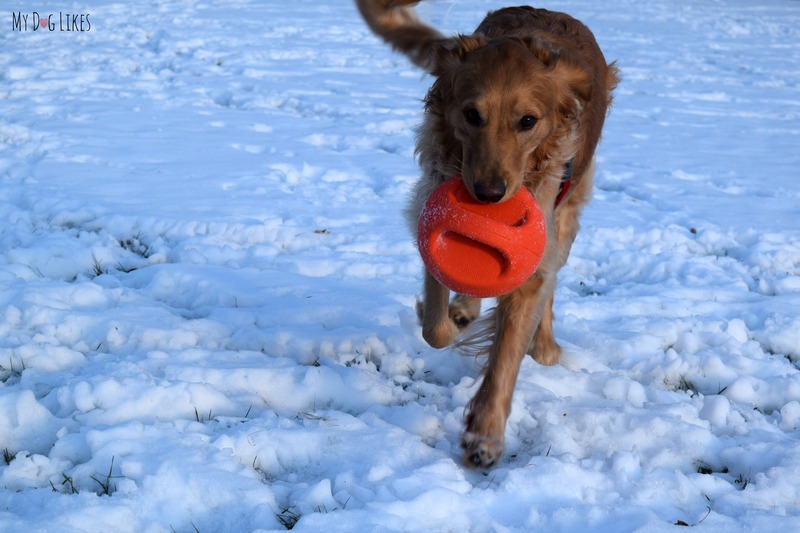 Like most dog owners, we are on a constant quest for durable dog toys. When we find one that can actually withstand a bully like Charlie we can’t wait to share it with our readers. That is why we are so excited to tell you about the Zeus Bomber! The Zeus Bomber looks like a small basketball with handles. It is orange, made of a natural rubber and textured for grip. Inside is a hollow chamber filled with air making it bouncy and buoyant. The Bomber comes in 2 different sizes and Zeus was kind enough to send us a “Regular” (7″) Bomber for review. Inside of the Bomber’s rubber shell is a reinforced polyester layer that helps it to maintain its shape. The handles on the Bomber are thick and sturdy and can clearly withstand some serious tugging force. The Zeus Bomber is an extremely versatile dog toy. It’s unique shape and construction lend itself to all sorts of play possibilities. The Bomber is an excellent fetch toy. 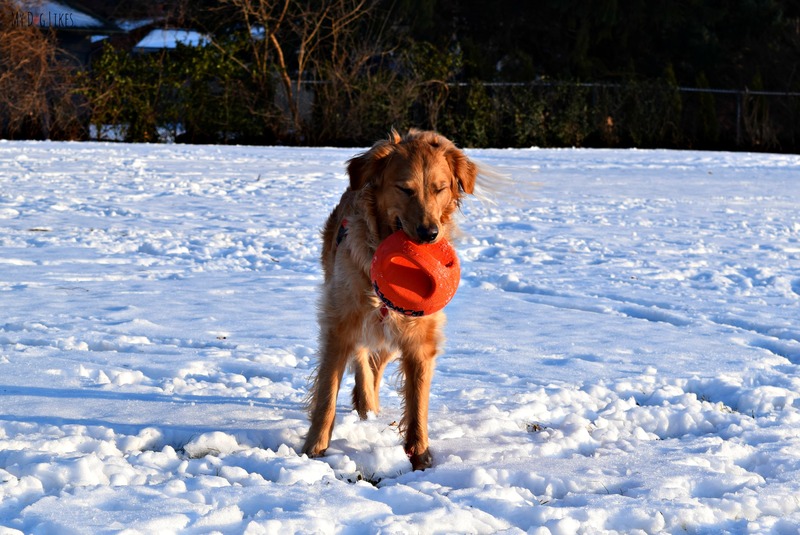 Not only will it’s handles help your dog to retrieve, but they will help you to throw it as well. As I mentioned before, it is a bit heavy so I would recommend a side or underarm throw! It also works well to roll it like a bowling ball! 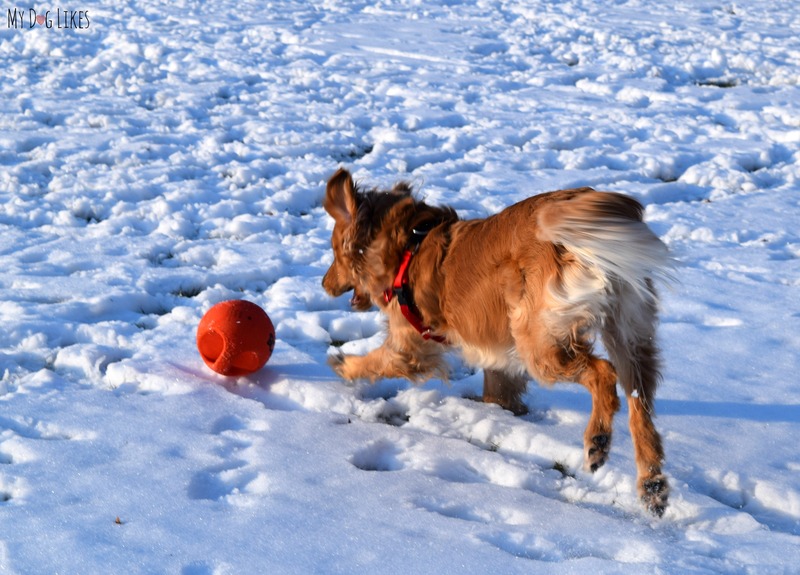 It tends to take some unpredictable bounces and turns which leaves your dog scrambling around to get it! One of my favorite things about the Bomber is that it is tough enough to be kicked. The way it bounces and rolls make it the type of toy that dogs will love to pounce on and chase. You can dribble it around like a soccer ball and have a blast as you both try to keep it away from one another! Keep away is a fun game to play with the Bomber, but I wouldn’t recommend kicking it hard or punting it because it is so hard. 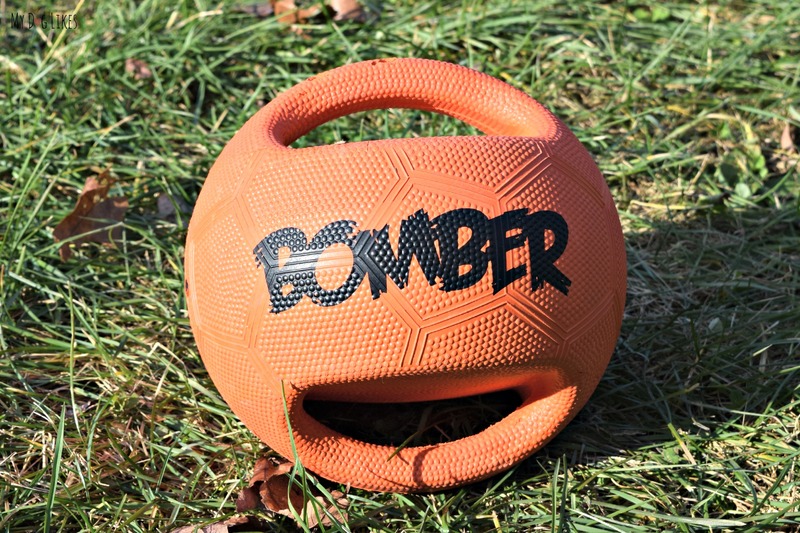 The 2 handles of the Bomber make it an ideal tug toy. Whether dog-human or dog-dog tugging, the Bomber can “handle” it. Obviously with 2 Golden Retrievers in the house anything that can float scores some extra points in our book. We can’t wait till spring rolls around and we can try this out at some of the boys favorite swimming spots! The Bomber is a ball – Should I be worried about deflation? The short answer, I wouldn’t be. It would take some serious effort and dedication to puncture this toy. I wouldn’t suggest leaving a really destructive dog alone with any toy for an extended period of time, but I have no concerns that with normal to somewhat aggressive play, this toy can hold up! Yes! Charlie loved when I bowled it down our hallway! After retrieving it a few times, he carried it around the house and sat down for a chew where he mouthed it pretty aggressively. Despite some rough play, (and that was before the photoshoot) you can see how well it has held up! Charlie loves running around carrying the Bomber in his mouth. The handles (when he uses them) make it very easy to do this and also add the element of “tug” that other products like this don’t have. The Zeus Bomber is versatile; easily transitioning to fetch by land and sea (or pond). 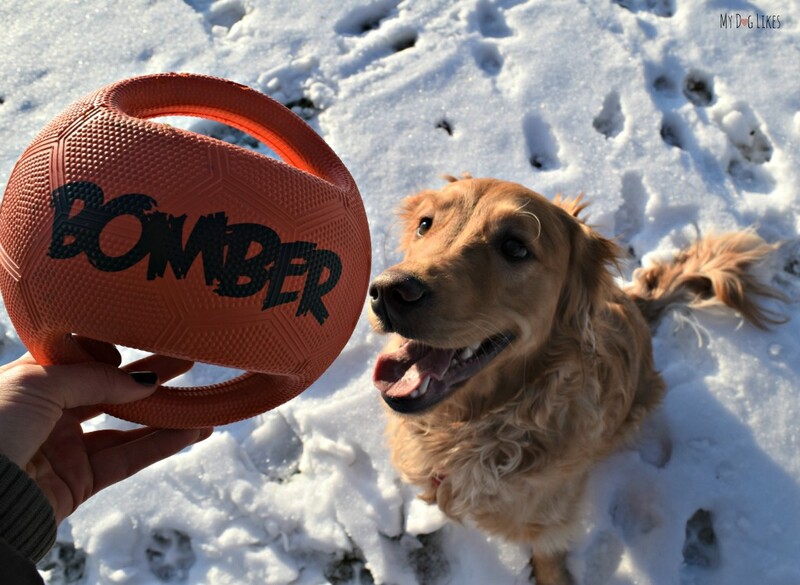 The bomber is extremely durable and holds up well to aggressive play indoors or out. The toy comes in two different sizes, regular (pictured) and mini (4.5″). For a medium sized dog like Charlie (65lb), either the Regular or Mini Bomber would have worked. If your dog falls somewhere in the middle, I would recommend that you make a choice based on durability (larger allows less of the toy to fit inside of those sometimes destructive mouths) or weight (how easily you think you can throw it and your dog can carry it). Unfortunately, I don’t think our small dog friends would be able to use this toy as easily, however, if he/she has a big dog ego and an all out play style, they could have lots of fun too! 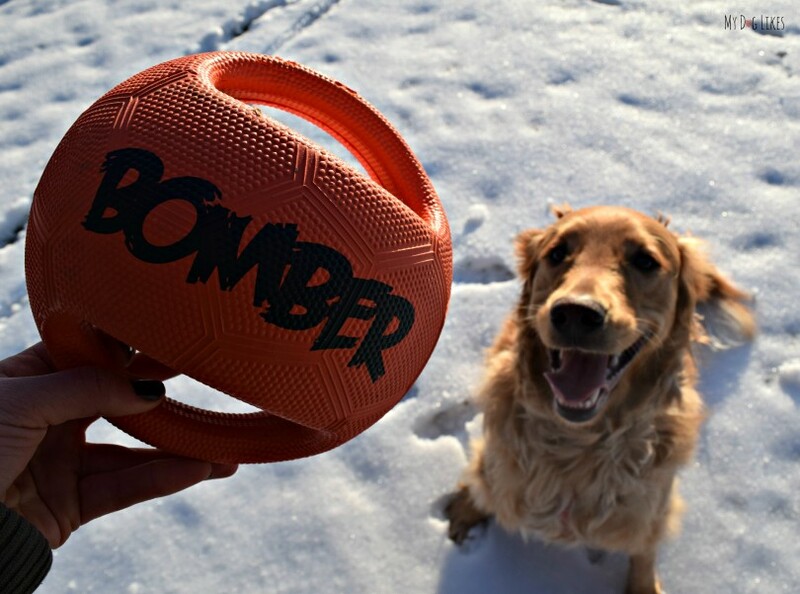 The Bomber is a truly tough dog toy and a great way to keep your dog fit. It’s unique shape makes it a ton of fun and can really mix up the play options inside and out! Want to get your paws on one of these awesome toys? Very nice review! We don’t play much with toys like that. Bailie might, but probably not. 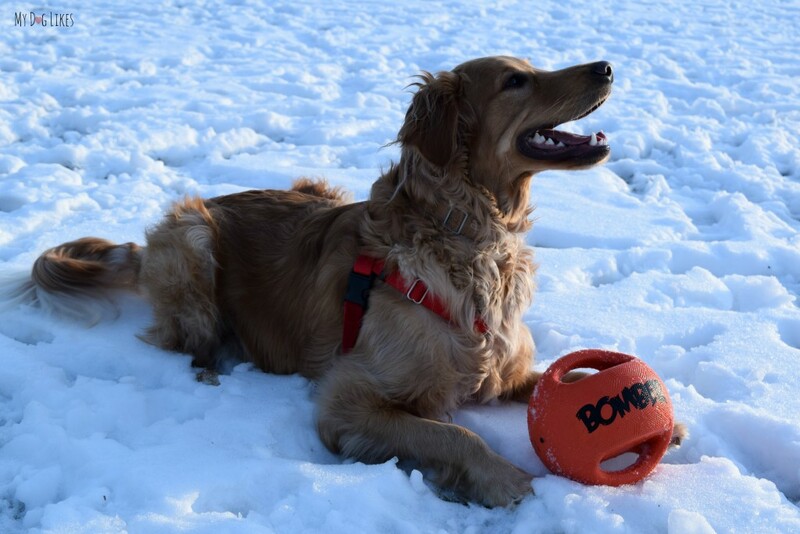 It looks to be ideal for retriever types that love ball play. Great it is tough! Thanks for joining the hop with some playful fitness. Thats the best way to have fun, right Emma! It is definitely specific to the dog and his/her style. Harley wouldn’t bat an eyelash at this toy. Looks like a great and more important, RUGGED toy – all that running around is such great exercise – Slimdoggy gives a big thumbs up! Yes so much fun!! Charlie just loves to run and retrieve!! What a fun looking toy! 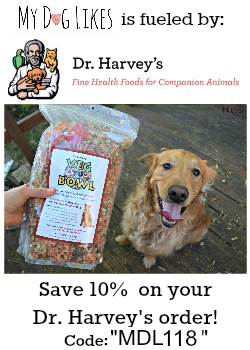 Barley only enjoys playing with soft toys–there’s something about about rubbery toys that she just doesn’t like even though she’ll humor me and shove them around with her feet or her nose–but this definitely looks like it could be a good gift idea for some of her friends! Harley is the same way with the aversion to rubber and plastic toys! If it isn’t soft he has no interest. It was lots of fun!! For a little friend like you it might be hard to lift it, but we know you are also very mighty so perhaps! It looks like a lot of fun for big dogs! We currently have three giant ball toys (for friends’ dogs) and Mr. N has barely even glanced at them lol. He’s not a big ball player. Sounds like Harley!!! No interest at all! Make sure to enter!! We are adding a giveaway!!! 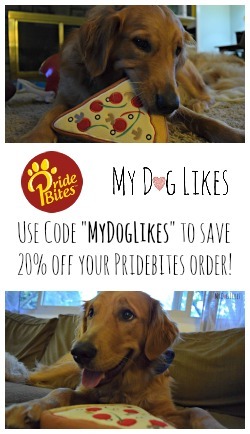 I would love to see the pups win! The Bomber looks like a perfect toy for our boy Buzz! He loves balls and carrying them around in his mouth. The Bomber would probably be a great “share” toy for our two pups since it has those handles! We will be adding a giveaway! Be sure to check back in!!! Maybe Buzz could win!? It sounds like a good toy. We will keep an eye out for it. We are adding a giveaway! Check back to enter! I have a thing for orange toys, so this would be perfect! And it’s also chewy? Even better! I always chew and run simultaneously while bringing stuff back. It’s not super Chewy but you can definitely bite down on it a bit! 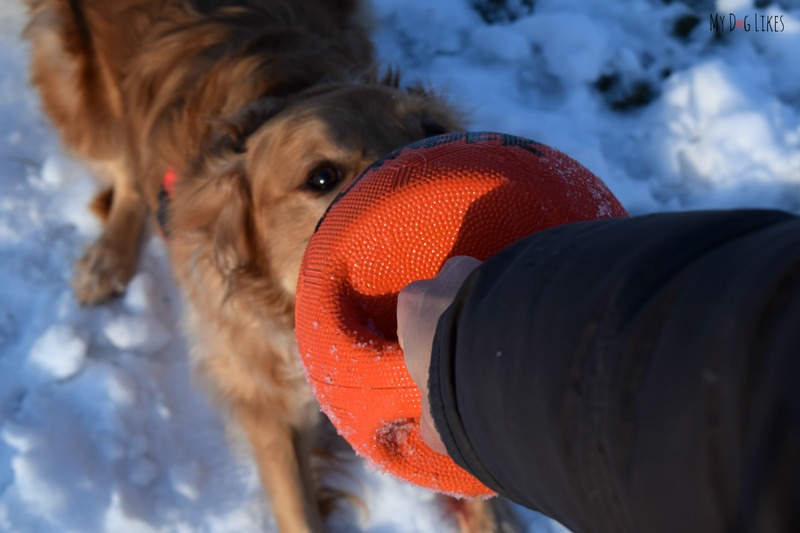 Its a tough toy, perfect for a Chewy Golden like yourself! We have two serial toy killers in our household, our golden Sheba and her Lab mix brother Luke. But if you say it stands up to some tough play, we’ll believe you! We are always looking for tough toys and appreciate this review. If we don’t win, I’ll be adding it to my shopping list for sure! Good luck!! Its a toughie for sure! We have 3 serial toy killers and we are always looks for new durable toys! This one looks pretty tough! I think this toy is up for the challenge!! Whoa, my dogs would love that thing!! Excellent!!! We wish we could give one away to everyone! So glad you enjoyed the pics!! We really try to show how we “live” with the products and think pictures are the best way to do that! I bet your pack would love it! That looks like fun! I bet my boy who likes Jolly Balls would love this. I can’t get him the JB with handles because they are too easily chewed, that handle looks like he could carry it but not gnaw on it. Entered the contest! Good luck Julia!! If he likes Jolly Ball this would be a winner! Maybe you will be too! You will have to put it to the Mort test!! My dog would love this, she has a basketball she plays with and is always trying to grasp onto it with her mouth. She also loves to tug. This would be a favorite. It sounds like the Bomber was made for your dog!! All toys no matter their toughness have a shelf life!!! Especially when they get lots of play!! We know that all toys will eventually destruct but we just want to get a good bang for our buck and know they got a lot of really awesome play out of it! It is now -my girls is 13 (at least, I rescued her as a adult, so not sure of her age), as you young one she tore apart everything except…oh I forgot the name of it -the indestructible one that all large dog owners get….for the life of me I can not remember the name sorry. She still runs around a bit but nothing like she did! Not sure, but I’d love to find out! This is one toy I don’t think Ranger could tear up! i think my dog would like this! This might finally be the one toy that survives my pup, Skylar… Thanks! This is a great review and I know it will be tough enough for my hairy baby. Looks like a great toy! I think it will hold up with my dog. So far Kong is king in our house but I would sure like to try the Zeus Bomber out on my hound dog! My dog would love this. Yes, I think this is tough enough for my furry friend. My Border Collie is also a dog toy serial killer 🙂 She has a HUGE stuffed toy that weighs several pounds that she runs around with, so the weight of the Bomber won’t be an issue. She may have met her match with the Zeus Bomber, tee hee. People are always shocked when I say Jaxon my black pug is a toy destroyer. They are like no he is a little guy. He sets out to destroy toys. Especially anything with fuzz or clothe on it. I think this is a great toy for him.I like to see if it stands up to Jaxon the Toy Destroyer. I have five rescued Treeing Walker Coonhounds, and while my senior girl doesn’t play much any more, the other four are in the 5-6 year old range and very active. My two boys would most likely be the ones to use this the most and I think it would hold up to them. 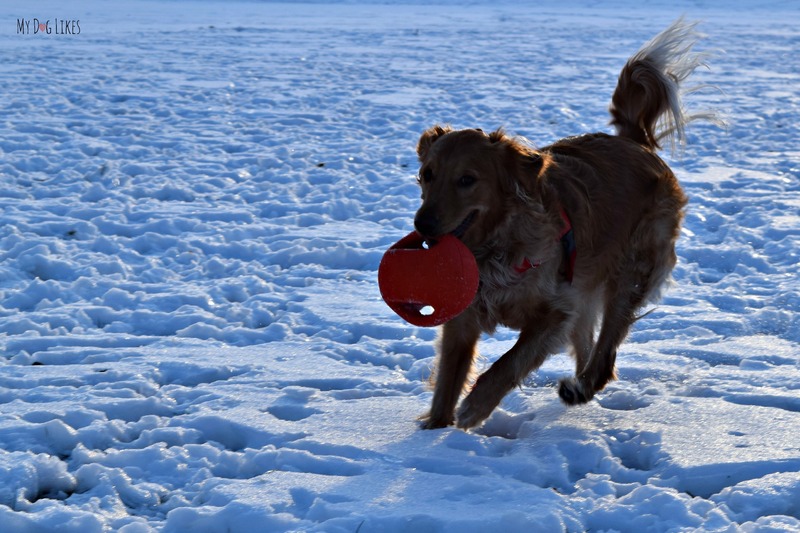 That is exactly the kind of toy we’re looking for, something for tossing/fetching that can also tug. I don’t let my dogs have free access to their toys, unless the Jolly Egg as that’s the only thing along with the black Kongs that they don’t destroy. I hope it would be tough enough-he destroys basketball but loves doing it-it is very hard to find toys tough enough for our rescued golden shepherd. He is only 1.5 years old and very playful and strong. WOW! 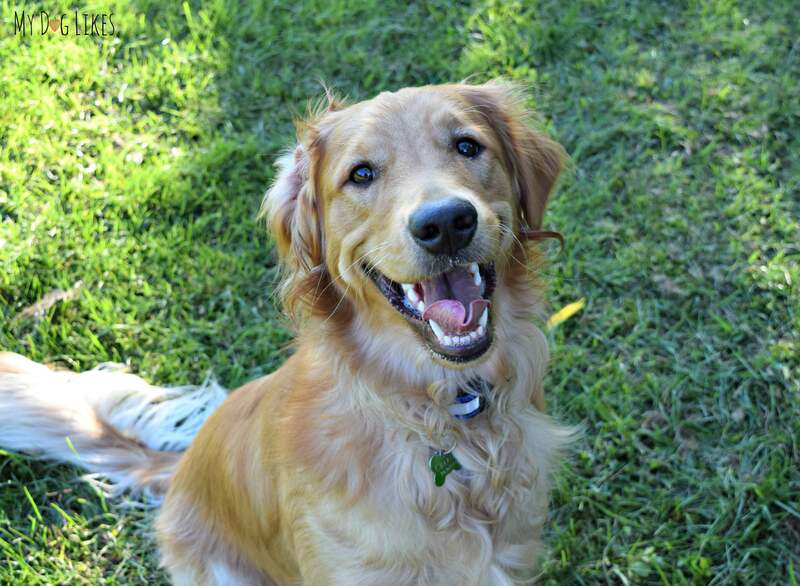 Golden Shepherd….I bet he realllllllly loves to chew! Good luck! It looks pretty tough! I hope it will survive. My dogs can destroy anything! But, as I was reading the review, I was thinking, this actually looks durable! So, I hope it would last! Artie loves balls and tug toys, I would love for him to find out if Zeus is tough enough for him. Certainly sounds like the Zeus Bomber would be right up Artie’s alley! Good luck! Oh, I’m so sorry – I know that can be frustrating!! 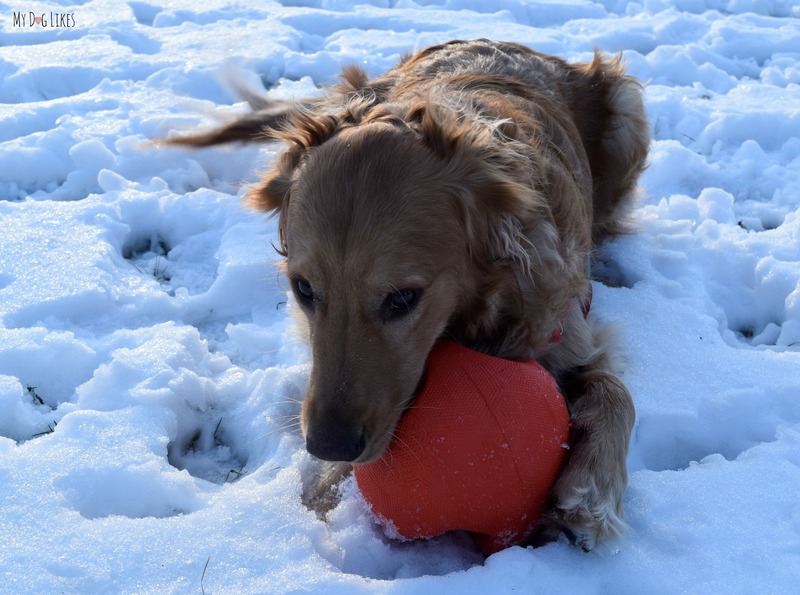 Our toy graveyard was one of the main reasons we started our blog – to spread the word about high quality and well made dog products when we find them! I think your dog would love the Bomber! Yes, I definitely think its tough enough for my dogs! I have a lot of dogs in my house (I foster dogs) and most of the dogs are either a litter of puppies (going through teething) or grown adults, and they go through toys in seconds! My dogs are a little too small for this one, but my granddog Paisley (my daughters dog) who is a beatiful chocolate lab would have a blast! I would love to see if this is tough enough for her!